2014 marks E. Sandy Powell’s 25th anniversary as an author, a good milepost from which to give a celebratory wave with her tenth book, written and released to share with writers/artists like herself. 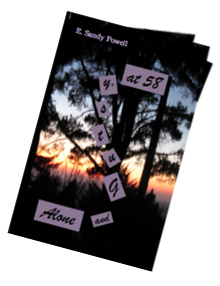 While “Alone and Gutsy, at 58” knocks Powell into the adult fiction genre, earlier of her works are also offered to adults who embrace heartfelt topics which focus on children, with wishes for ease. Besides being a writer, Powell is simultaneously the glad mother of three grown kids over whom she has been 43-years-and-ongoing jubilant, on a daily basis: her son and daughters, with dears, daughter- and sons-in-law, have not only created families with so much love within them, they’ve each in their sui generis made work lives they love, contributing greatly to communities in their immediate areas and farther afield online. Through them, Powell has been given and adores her dear dear grandsons, five. “Alone and Gutsy, at 58” is a ‘coming of age late in life’ story, influenced by the author’s earlier parenting and her grandparenting, and of course by her own writing life. “Alone and Gutsy ...” is the book she had wished to find when she was 58. It took the author some years to muster the courage to bring this book out. In this 25th year, invitations go out for collaborators to help translate Powell’s 2013-published “Hope for our World” into languages for readers worldwide. If interested, welcome! Be in touch, please. mailto:esandypowellbooks@yahoo.com Excitement about the project far outweighs translating experience.